You need to go to section System > Tasks to start monitoring task list. 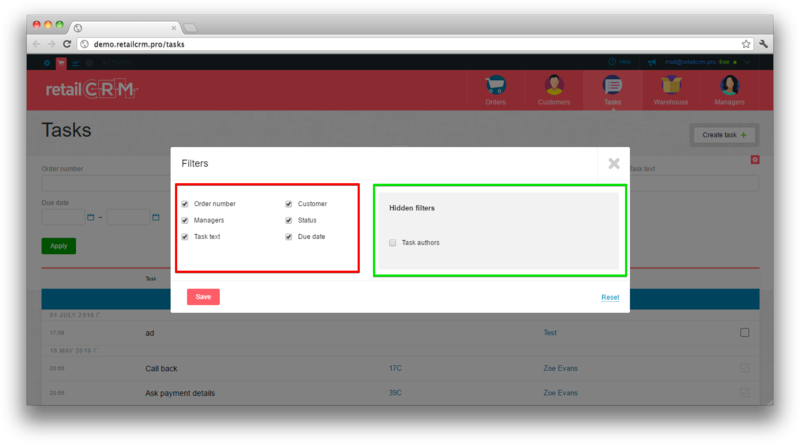 A task can be found using filters above the task list. There are also hidden fields that can be aded to the filter. If you open the line “Show N future tasks” in task list, the blue background contains tasks with a future date then now (tomorrow and further). You can mark the task as completed directly in task list, not entering the task itself. You need to tick the box right on the line. A trash bin icon will appear meaning you can delete the task from the list. Note: When removing customer, task is removed as well. 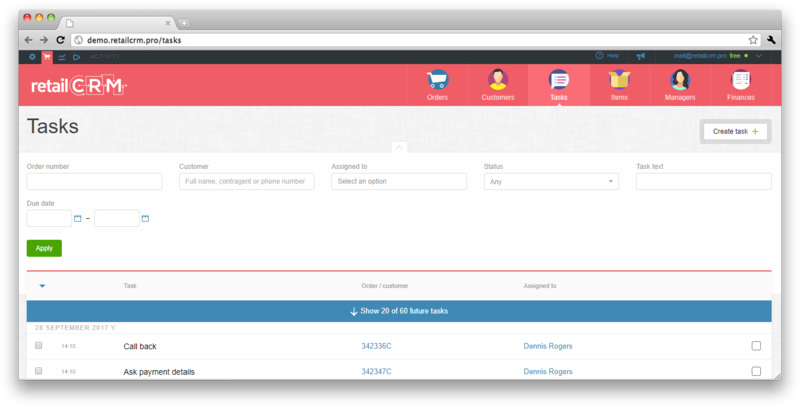 When deleting an order that has attached tasks, tasks will be also deleted. There is an option of group change of the person responsible for the task. To do it, you need to checkbox those tasks where you want to change the executor. The "Actions" button will appear, pressing which you will open the menu, where you need to mouse at "Change the executor" and select the user you need. 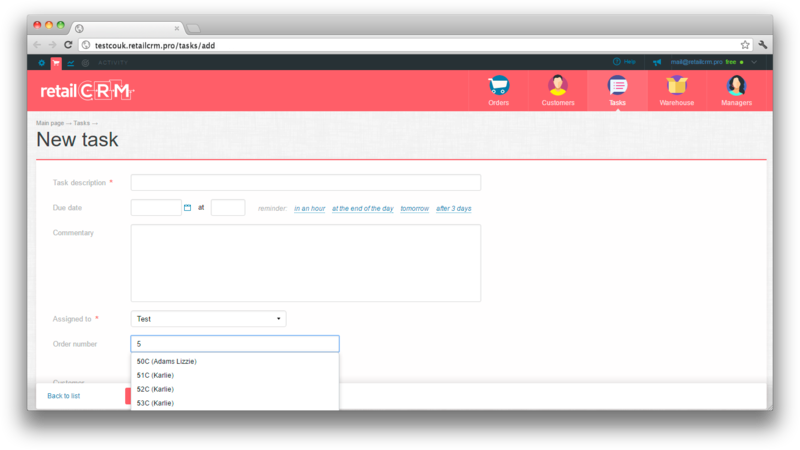 It is also possible to prohibit task view for a definite user group, or on the contrary, allow to view all the tasks. To do it, you need to go to Administration > Users > User groups. 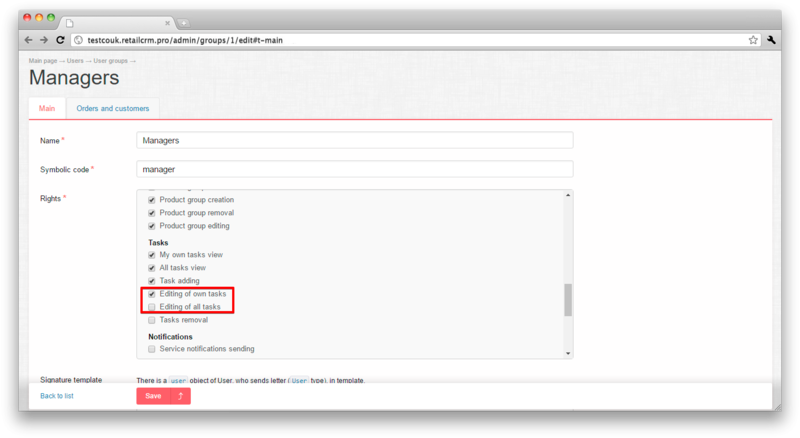 After that select the user group and set the necessary checkboxes in the "Rights" point of the "Tasks" subsection. In our case there are two checkboxes: "Editing of own tasks" and "Editing of all tasks". Important: «Editing of own tasks» – is an option of editing just of your own tasks. This option is necessary for restriction of editing of tasks which are not yours. «Editing of all tasks» – is an option of editing of all tasks, including your tasks. Press button “Create task” in task list to create a new task. When you create a task in the customer card, it will be automatically assigned to this customer. 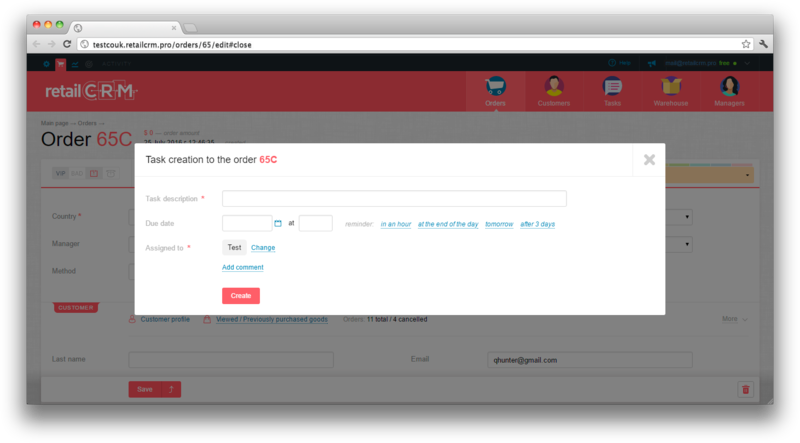 If the task is created in the order card, it will be automatically assigned to this order. 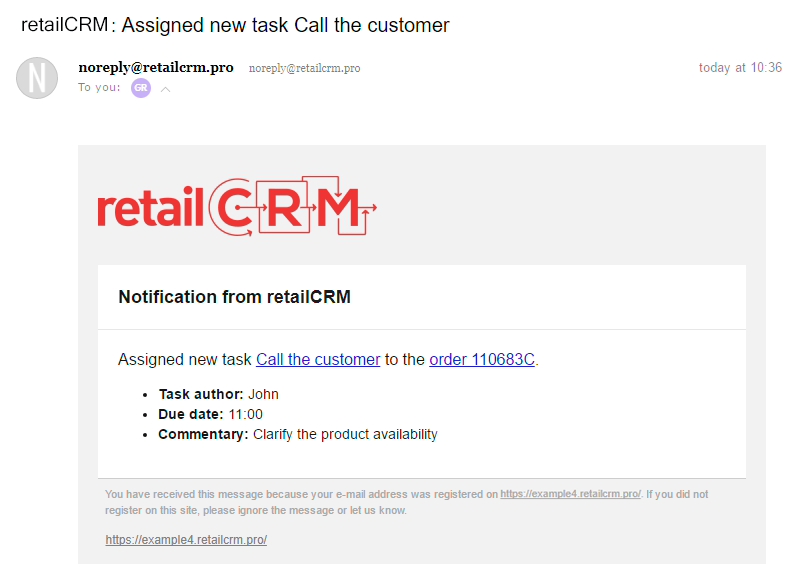 When you create a task in the task list, you can specify that it is a task by customer or by order (both of these parameters can be specified simultaneously only if the order belongs to the selected customer, in this case the task will be displayed both in the order and customer cards) and you can also omit these parameters if the task is not related to the order or customer. If task date is set and time is not, then time of task creation will be set automaticaly. 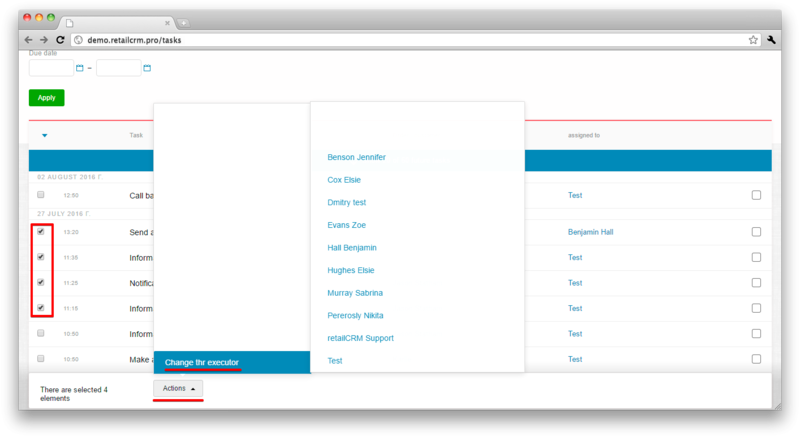 By that a new field “Status” will appear after task creation having two values “Open” and “Closed”. The first red digit on this screenshot shows the number of expired tasks. The second grey digit shows total number of opened tasks. Pressing link “Tasks by order” will open popup form with list of tasks. Pressing icon with green plus will show a short form of adding task to order. Here you can change the assigned manager and add a comment if you wish. The same thing is when adding and looking through customer tasks. 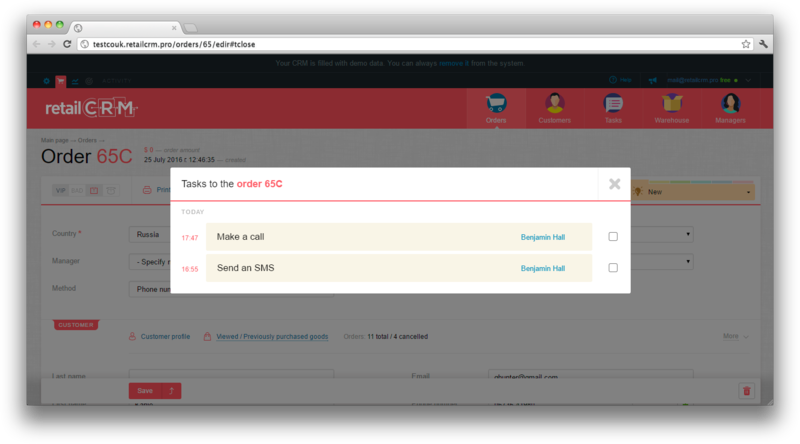 The system notifies automatically when and what task needs to be done. 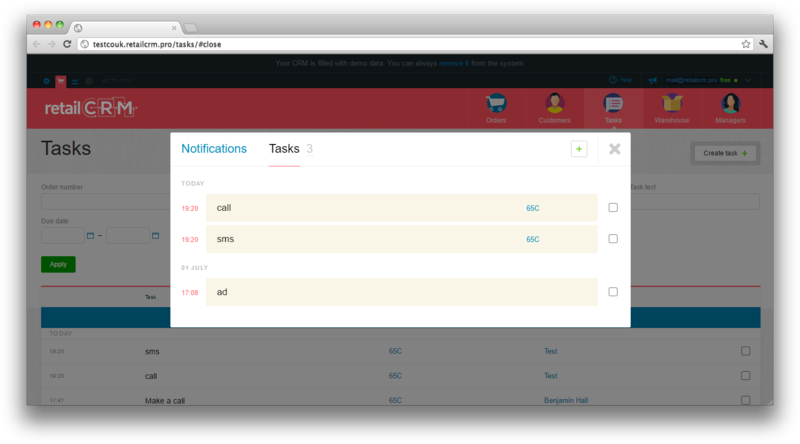 The check for the expired tasks and notifications on them is not available in the demo version of the system. Notifications appear every 5 minutes. 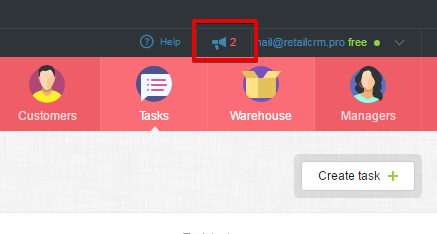 The notification will be shown untill you close it, even if you refresh the page or go to other system sections. Note: mass notification closure is available. Can be done by holding “Shift” button when closing notifications. 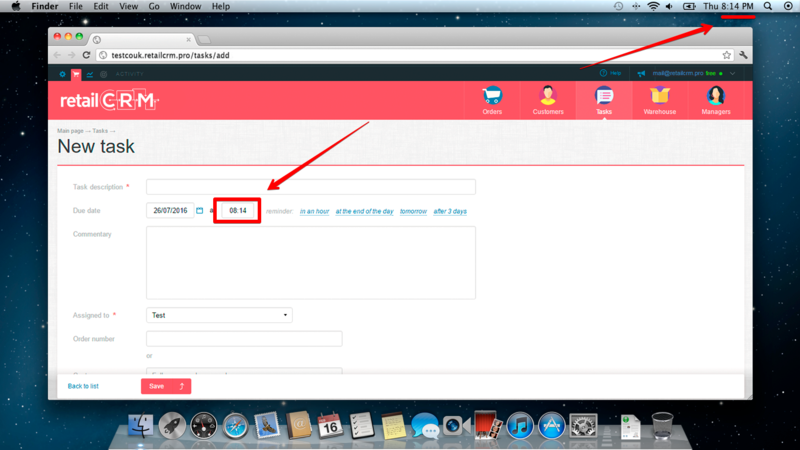 If you suddenly missed notification or closed it, the list of notifications is available in system interface heading. A list of all notifications will open, among which are task notification. Screenshot below shows the task on which a popup notification has been made. An area is underlined, pressing which you will see future tasks (with the date later than current). And here in notification list you can tick the box near the task meaning that it’s complete. If there are several system tabs open, notifications appear only in active one. If all tabs are inactive, notifications appear only in one of them. When new notification appears in the inactive tab you will see a notification in Favicon and browser tab heading. Along with the notifications in the system, an email will be sent to user (if "Notify via e-mail" is enabled in the user settings). The letter comes as in the moment task creation, as well as at the time specified in task for reminder. There are task author, due date and author`s comment in notification. Mail notifications come to task author and the manager assigned if they are different.